Some goals are made as a child. To begin, I was raised in a poor family, and poverty is just not that appealing to me. Let me first clarify that I don’t mean the poverty of a third world or developing country. I had a roof over my head, food on the table, and clothes to wear. There was no outhouse, no water from a well, and no walking to school. But by normal standards, my family was poor and as a little boy, I knew that other people were better off than us. My dad was the sole provider for a family of 11. There are 3 girls, 6 boys, and my parents. He worked for the City of Los Angeles as a landscaper at the Ontario airport. He made decent money, but raising a large family with that job is difficult. The house I grew up in was a 900 sq. ft. house with three bedrooms. One bedroom for the girls, one bedroom for the boys, and the last bedroom for my parents. Life was quite simple. No tv, no late-model cars, no fancy toys. If it wasn’t essential, it wasn’t purchased. Somehow, as a youngster, I knew that I wanted to be rich. There would be a nice (bigger) house. New toys, nice cars, a refrigerator with my favorite foods – you know, all the stuff that little children imagine. But I was determined to dream big about money too. My childhood self wanted a job in an office that paid really well. Not $50K a year. Not $100K a year. I was going to be a millionaire. I still want to be a millionaire. And sometimes I ask myself why I am so determined to become wealthy. Money doesn’t necessarily mean happiness. I understand that. But money solves a lot of problems and has a huge potential for a positive impact for others. If I can reach that goal, then I don’t let my childhood dream just fade away. I know I’m an adult, but maybe keeping this dream alive is a way of making sure that I keep some sort of familiarity with my childhood. Becoming a millionaire means that I can fulfill a childhood goal. It’s like keeping my promise to myself. “The Millionaire Next Door” and Dave Ramsey's “Your total Money Makeover” are easy and helpful reads regarding personal wealth building. 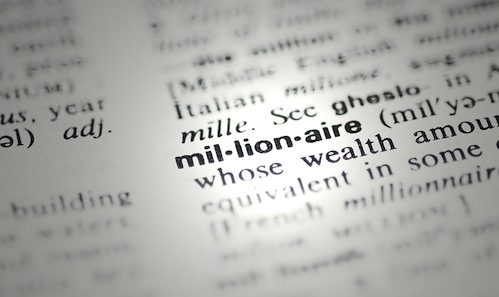 My husband, at one time, also had a goal of being a millionaire. I can't relate to that desire really. But I can definitely say that life is much less burdensome when money is something you make decisions with, not worry about. Living below one's means, with minimal or no debt is not at every moment “fun”, but much more peaceful than a maxed out, paycheck to paycheck existence. If you can attack any debt now, kill your mortgage if that's all that's left, then you set yourself up supremely well for a future with a family of your own (if that's your desire). I know of a family whose lifestyle at one point involved a yearly income of 200,000, coupled with a dedication to live at the median income at the time ($40K or something). They gave away the rest to local organizations and individuals in need. Idealistic (generous to the exttreme) and ideal.